*Data taken from official Kappa Delta Pi honor cord provider website on 3/12/2013. Kappa Delta Pi Graduation Cords as offered on their official website are Double Cords (two separate cords tied together). Their colors are purple and green, or more specifically purple and bright green. The graduation honor cords for Kappa Delta Pi are braided cords, meaning each graduation cord are two parts purple and one part bright green. 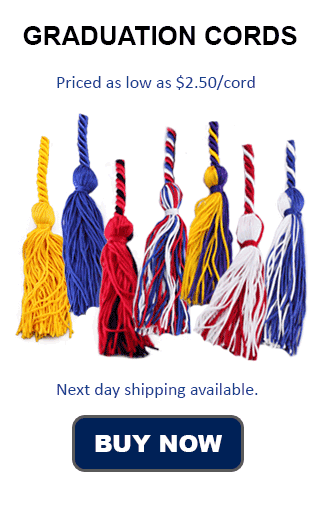 The tassels are also purple. Cords include a small metallic charm. Honors Graduation does not provide official Kappa Delta Pi cords, and cannot provide braided purple and green cords with metallic charms. What we could do as an alternative is a purple and bright green double cord, where one purple graduation cord and one bright green graduation cord are tied together. Other than that we do not have graduation cords for the honor society Kappa Delta Pi. Kappa Delta Pi is an Education Honor Society. It honors students in the disciple of education. The society has official colors of violet and jade green. Hence the graduation cord colors of purple and bright green. Kappa Delta Pi is also known as KDP. KDP, and their Greek Name, Kappa Delta Pi, is an acronym for their motto: "Knowledge, Duty, Power." It is unclear which came first, the name or the motto. Founded in 1911, Kappa Delta Pi is one of the older single disciple honor societies. Kappa Delta Pi is an international Honor Society in Education, which is clearly stated on their logo. The logo of KDP also features the Greek letters Kappa Delta Pi superimposed over a purple scroll with a beehive and two bees on the scroll. To become a member of Kappa Delta Pi, and to be able to wear the Kappa Delta Pi Honor Cord at commencement exercises, one must be in the top 20% of those in your schools education program. An undergraduate needs to have at least a 3.0 grade point average overall, and Graduate students need to have a 3.25.